Two life changing dates are approaching for my wife and I. The first is November 23rd. That date will mark a year since we lost Sojourner, our son who was only 16 weeks along. The second date…well, we’re not sure when the second date is, because we’re expecting a little girl sometime around December 10th. It’s really hard to describe the heart-rending sorrow and the soaring excitement that we’re both feeling right now. IBLP put out a series of booklets about health some years ago, called Basic CARE. CARE, of course, was an acronym, but I don’t know what for. (What is with IBLP and acronyms?) They printed one about miscarriage, and I had thought about reading through it and responding to it, but it quickly became clear that I’m not ready for that just yet. Maybe sometime in the future I’ll look at it. So instead I read the booklet on morning sickness. The morning sickness booklet was interesting in that they managed to spend a lot of words to say so very little. 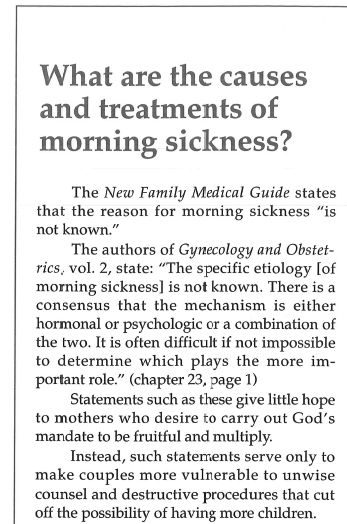 The booklet boiled down to We don’t know why you have morning sickness. Maybe you can try fasting. Maybe you are experiencing guilt. Maybe you should eat crackers between meals. Here’s a few random testimonies and pictures of babies. NO MATTER HOW BAD YOUR MORNING SICKNESS, DON’T EVER CONSIDER GETTING YOUR TUBES TIED!!!! I was intrigued to see how they managed to make the booklet be about the same things they always talk about. There were guilt trips, advice to fast and lots of words about the blessing of children. The guilt trips were not surprising considering the source (and honestly not nearly as heavy handed as in many other IBLP resources). The advice about fasting was fairly well balanced; there were cautions about over fasting and advice to speak to a doctor before committing to fasting. They even wrote at length about the importance of getting medical attention if you become dehydrated. And even though I’m somewhat suspicious about fasting to fix morning sickness, there is some evidence that fasting can be good for you. What I want to focus on today is this talk about children as a blessing. Before I go any further, I want to state very clearly that all children are a blessing from the Lord. Losing our son last year, and now looking forward to the birth of our baby girl has impressed on my how incredibly precious every life is, and how each child is worthy of love and respect. But what happens in this booklet is very legalistic. God’s word tells us that children are a blessing, and Gothard takes this as a command to have children. I know Mark Driscoll has fallen into his own very serious scandal recently, but he said something a few years ago that I think is quite true. When speaking about Proverbs, he talked about how legalists take blessings and turn them into commands. This is exactly what Gothard does with verses about children. Let’s look at the booklet now. No, no, no. Such statements serve to inform couples of the facts. The facts are that we don’t know what causes morning sickness. The fact is that you cannot know before you get pregnant if you are going to experience mild or extreme morning sickness. The medical profession has no business giving “hope to mothers,” their business is to fully inform people of the facts. This is not a small, minor deal. It would seem that whoever wrote this booklet would prefer that doctors not inform their patients of the facts. It would seem that having lots of children is a more important and higher goal than informed consent. This is a big problem. This poor mother is so sick she fears that she is going to die. Having never been in a situation like that, I can’t say that I’m able to understand what that must be like. But I imagine it must be terrifying. I imagine looking at my children, my spouse and other loved ones and wondering how they will handle my passing. I would feel great sorrow when I thought about not seeing my children grow into adults and following their own dreams. I’m sure this mother felt scared and vulnerable. 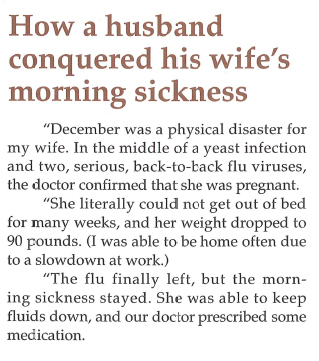 What would you do if your wife told you she thought she might die? What if she said this was the last child she wanted to carry (assuming she lived)? It’s hard to imagine, but I think I know what I would do. I would hold my wife in my arms and I would cry. I would tell her how much I love her, and how important she was to me. I would pray desperately that God would let her stay with me. And I would tell her that whatever her decision, I would respect and support her in that decision. This husband? He thought about the people who were watching. Hearing that his wife thought she might die, he thought about how that would make him look. It’s hard to find words to describe how truly horrible that is. 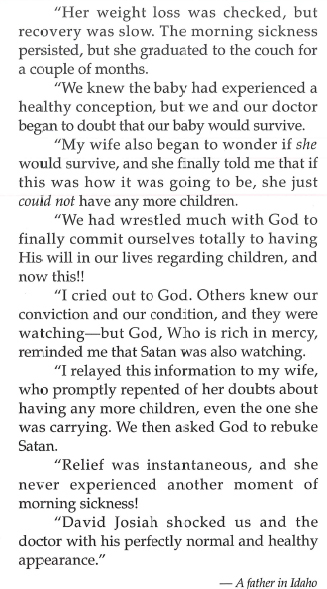 Then, having given due consideration to his reputation, this husband used fear tactics to brow beat his wife to repent of fearing for her life. I was just thinking about how I would tell my wife I would respect her decision if we were in the same circumstances, and it occurs to me that I’ve actually already done that. Before we even got married we talked about birth control methods and how we would use them. Over the past few years we’ve continued to dialogue about children and birth control and our family. And I don’t think we’re an unusual couple; anyone with any decent amount of respect for their spouse will talk to them about these things, and will show respect for their wishes. Both partners should agree that they want to have a child, rather than one partner brow beating the other when she’s already sick and exhausted and scared. When looking at these two ways of responding, it’s very important to be aware that one is healthy and the other is abusive. And it’s pretty scary to see IBLP holding up this abusive husband as an example to other couples. Is there another dangerous unstated insinuation by the testiomony that you highlighted? Btw, I have enjoyed your blog, keep up the good work.